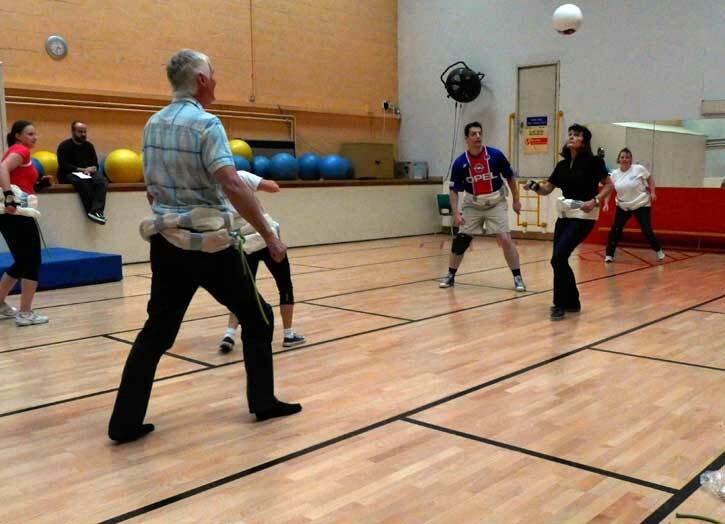 The ball used was a normal volleyball and participants were wearing their regular gym clothes and knee and wrist and/or elbow pads. Before the workshops, we had crafted some ‘ballgame belts’ for hip protection, made from long pieces of rope, wrapped in sheets (and fixed with duct tape). We started the practical session with a warm up, practicing the different ways of hitting the ball with the hip or elbow. After that we started playing, with Dr. Helmke acting as the referee and commentator. We split into two teams of three people each and ended up playing for a few hours. A point was given to the team that managed to play the ball in a way that it hit the ground in the other team’s playing field with the opponents being unable to play it back. We were only allowed to hit the ball with hips, elbows, and knees. Although the iconography often shows players leaning backwards to hit the ball with their hips, we found that in practice (at least for us unpractised players without the ‘real’ equipment) we ended up hitting the ball mostly with our knees, and, if it bounced a bit higher, with the elbow. The playing itself was a load of fun and we found that for us it mostly consisted of short bursts of frantic activity, until the ball went out or a point was scored, interspersed with breaks in which the teams gathered themselves (and often got off the floor). For most of the time the teams went with a ‘striker’ in front and two people standing further behind and a bit apart, more as defenders.